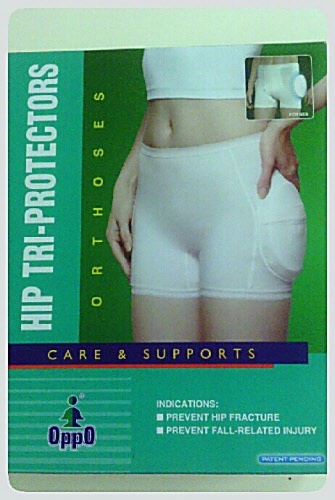 The hip protector features multi layer components including an outer shield, air bag and shock absorber for optimum protection of injury during a fall. The airbag is light and soft which enhances comfort and stability. The shock absorber can absorb most of the shock force on the hip joint. The outer shield acts like a shield to help protect the hip from direct and strong impact from the hard surface during a fall.